North side of Winchester Road. Notes: Bishops Waltham started off as an Anglo-Saxon village, and steadily grew to become one of Hampshire's largest villages, despite being burnt to the ground by the Danes in 1001 AD. By the time of Domesday Book (1086 AD), it had a population of around 450. By the thirteenth century it was developing into a flourishing market town, but its importance as such diminished rapidly as nearby Botley grew in importance following the opening of the Gosport branch railway by the L&SWR on 29 November 1841. By the 1860s, the town was once again beginning to prosper thanks to a variety of schemes promoted by entrepreneur Sir Arthur Helps. After an early career in politics, Helps purchased the Vernon Hill estate near Bishops Waltham in 1841 and a private income allowed him to turn to writing books and plays for the next twenty years. He was not, however, forgotten by his political friends, and in 1860 he was appointed Clerk of the Privy Council on the recommendation of Lord Granville. This appointment brought him into personal communication with Queen Victoria and Albert, Prince Consort, both of whom came to regard him with confidence and respect. In 1862 he established the Bishops Waltham Clay Company for the manufacture of bricks and terracotta. He was also heavily involved with the Bishops Waltham Railway Company, set up to link his brickworks (and the town) with the main London-Southampton line. With the opening of the railway, Bishops Waltham was once again developing into a prosperous market town, being home to several agricultural suppliers, merchants and a cattle market and Abbey Mill which was built in Station Road in 1862. Helps also financed the town's water works as well as the coke and gas works which lit the town and the station from 1864. He also provided the land for the Royal Albert Infirmary which opened in 1865. These new industries provided much of the early revenue for the railway which became more important over the years as is was quickly realised that the branch would never generate much passenger revenue, with services being used only by schoolchildren and a few regular commuters to Botley (with connections to London) and Southampton. In the early years of the twentieth century there were occasional excursions to destinations including Portsmouth and Bournemouth, and infrequently to other south coast resorts. These all stopped with the outbreak of war in 1914 and were never reinstated. As soon as the branch opened, a siding was laid into the clay works to the north-west of the station. Regular supplies of coal and coke arrived at the clay works. The works shipped out bricks, tiles and other terracotta material. By the time the Bishops Waltham branch was close to completion no work had been done on building the terminus station. To avoid delaying the opening, a temporary timber station was built on the south side of Winchester Road; this opened on 1 June 1863. An account of the opening day can be found in the branch history below. The permanent terminus took nearly two years to complete, finally opening in March or April 1865. The terminus was immediately north of the Winchester Road level crossing, the only level crossing on the branch. In 1862 there had been a proposal to replace the planned crossing with an underbridge but this was dropped due to the high cost as part of Bishops Waltham pond would have to be drained. The station comprised a single platform on the up side of the line. The station house was a dignified villa with rectangular window openings and a hipped, tiled roof with a modest overhang. The red and yellow brickwork appears to be horizontally-coursed ‘nogging’ within a rectangular timber frame. A single-storey office range adjoined the house, of the same design as the station house, with a lean-to attached (also with ‘brick nogging’ effect) and a urinal beyond. The building housed the booking office, general waiting room, ladies’ waiting room and toilet and a lamp room. The chimneystacks were of a particularly jolly design. The tapered bases were enlivened by diagonal stripes and pale horizontal courses punctuated the main shafts while the cornices of the stacks were dentilated. The platform verandah extended the length of the house and office range; it was initially supported by two wire stays fixed to the building wall but these were later removed and replaced with two timber pillars. Its roof sloped at a very slight angle upward from the building and it was surrounded by a deep valance with modest decoration. Two end-screens had been added by the turn of the twentieth century. At first the station did not have its own stationmaster and was administered by the stationmaster at Botley. As traffic increased however, Bishops Waltham eventually was allocated its own stationmaster, James Whitney, who took up the post in 1875. Later stationmasters were Arthur Kneller (1899 - 1907), Charles Colbourne (1907 - 1920), Sidney Everny (1920 - 1924) and Charles Blount (1920 - 1931). 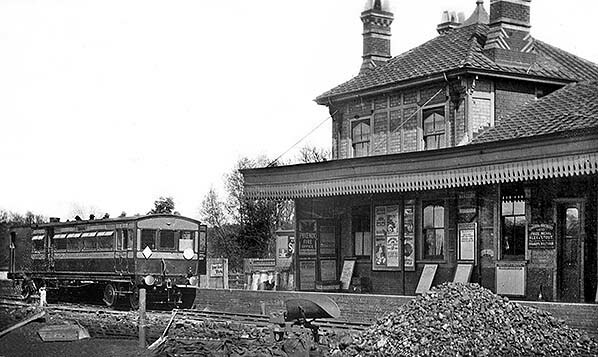 Following closure to passengers in 1932, the station once again came under the control of the Botley stationmaster. By the turn of thetwentieth century Bishops Waltham had a staff of seven comprising a Class 4 stationmaster, a booking office clerk, two porter/signalmen, one goods clerk, one porter/guard and one passenger guard. Other staff were based at the engine shed. As built, there was a passing loop opposite the platform; from this a long siding curved away to the north towards the brickworks. From this line a short siding trailed back towards the level crossing to serve a coal yard. Beyond the platform, a trailing siding ran back into the cattle dock which was, in effect, an extension of the platform but set back from it by the width of the siding. Livestock pens were provided on the dock. The dock was extended with three additional pens being added in 1914 following a surge in livestock traffic in the first decade of the twentieth century. The yard was always especially busy during the cattle and sheep sales. The pens were removed following the end of local livestock sales. The yard crane, which had a capacity of 5 tons, was located on the dock to the north of the pens. Beyond the dock, the loop and the main line continued north for nearly 300yd and a third parallel siding ran through a brick goods shed with a wagon turntable on the north side. The goods shed was similar in design to the station building having a pitched slate roof and a wide canopy with a very deeply fretted valance over the road vehicle loading area. The shed had a second 5-ton capacity crane mounted on the internal loading dock. It had originally been planned to build the goods shed behind the cattle dock but there was limited space there due to the proximity of Bishops Waltham pond. In later years (possibly during WW2), a prefabricated grain store was erected at the south end of the goods shed. The Bishops Waltham Gas and Coke Company began production at a site to the north of the station in March 1864. The town was lit by gas for the first time on 4 March that year and Bishops Waltham is believed to have been one of the earliest towns in the county to have gas street lighting. To keep the works supplied with coal the goods yard siding was extended into the works. Regular supplies arrived at the gasworks including coal from both Brays Down Coal Company and the Somersetshire Coal Company and timber from Messrs Gamblin’s Sawmills at Newtown. At its peak, small fire coal for the retorts arrived at the works every day. Complete coal trains were sometimes required with three of the four retorts in operation much of the time. The retorts were emptied at 3.45 pm each day and the coke that was removed would then become one of the primary outgoing products. Although much of it was sold to local coal merchants, some was loaded onto trains along with tar and creosote which were also produced at the works. The coal was transferred from the siding to the retort house by a narrow gauge line raised on trestles alongside the siding. Small tipper wagons were pushed along the line into the retort house by hand. Initially no locomotive stabbing facilities were provided at Bishops Waltham although it is possible that the goods shed may have been used if required. The L&SWR urged the BWR board to provide an engine shed in January 1866 but this request was declined as insufficient funds were available. The matter was again raised by the L&SWR in January 1876 and again in March 1877 when estimates were provided of £200 for a brick shed or £120 for a timber shed. A single-road through timber shed to accommodate two tank engines with an adjacent water tank on a brick base and coal stage was eventually built, presumably at the expense of the L&SWR. It was located on the main line between the station and the goods shed. By 1876 the wagon turntable had been removed and the goods shed siding rejoined the main line to form another loop; this did away with the need for a turntable. Bishops Waltham was provided with a signal box in 1885; this was located on the down side of the line immediately south of the Winchester Road level crossing. The box was typical of others in the area at that period and was probably provided with a 16-lever (with two spare) Stevens frame. By 1898 the layout of the goods yard had been simplified with the removal of the loop back to the main line at the north side of the goods shed. Coal was probably the most important product coming into the station and the first coal merchant to be established in the station yard were Messrs Geo. & Edwd. Clark who were also grocers, drapers, millers and maltsters. For many years the principal coal merchant was Messrs Reeves & Tebbutt who opened an office adjacent to the level crossing in 1890. From 1910 this prime position was occupied by the Colliery Supply Co and later by Portsmouth based merchants Merssrs J E Smith who remained there until closure in 1962. Over the years numerous other coal merchants were accommodated; however they did not have offices and instead rented space at the far end of the yard close to the goods shed. Another important outgoing commodity handled by the yard was farm produce with Bishops Waltham becoming the railhead for many farms in the lower Meon valley. Although it diminished in later years, as many farms moved over to road haulage, this traffic continued until closure of the line. The bulk of this produce was arable - consisting mainly of cereal crops and sugar beet - but soft fruit and dairy products were also important, with churns of milk being despatched from the station daily. The station also served the local brewing and milling industries with regular deliveries of wheat and other cereal crops to the Abbey Mill. In 1902 James Duke & Son took over the mill and their business continued to generate considerable traffic until closure. Much of Duke’s traffic was handled by their own staff in the goods shed siding. Around the turn of the century a 55yd private siding was laid ½-mile south of the station on the down side. It served the Abbey Brewery of Messrs Edward & Sons. The siding handled only incoming traffic for the brewery, mainly hops and malt, but it also handled some farm traffic, mainly from nearby Brooklands Farm. Its use declined after WW2 and the siding was lifted in September 1948. The Crown Hotel acted as parcel agent. Initially parcels were delivered mainly to local shops, but with the growing popularity of mail order companies such as Littlewoods in the twentieth century many parcels arriving at the station were destined for delivery to residential properties in the town. The gas works was taken over by the Gosport & District Gas Company on 1 March 1932. Following the end of gas production that year a double lift gasometer was built on the site. With an average of five passengers travelling on each of the trains, closure was inevitable. It was initially considered by the Southern Railway in October 1930 but was delayed until 1932 although from 1930 a guard was no longer provided on passenger trains. Following closure to passengers from 31 December 1932 the engine shed was closed from 2 January 1933 and was quickly demolished, but the site remained a stabling and servicing point until closed by BR in 1958. The signal box closed in December 1935 and all signals were removed, with the points being operated by hand levers. By this time, only a single Grade 1 porter was retained at Bishops Waltham. He was responsible for dealing with the various traders, loading and unloading of wagons and all the paperwork relating to the station. Although goods traffic began to decline after WW2 the station still handled considerable coal and mill traffic. By 1953 the goods shed had been taken out of use and rented to Duke & Son for use as a grain store. The brickworks siding was lifted in 1947, and by 1956 the brickworks had closed and scrap dealer Meon Valley Metals took over the works site. For a while they used the branch for outgoing scrap metal. Complete closure of the station was considered in 1952 but traffic levels were sufficiently high for the station to remain open. Total receipts for that year were £24,941 with 6,643 tons of merchandise and minerals being handled. There were 5,420 tons of coal, coke and other fuels with a further 5,409 tons of parcels. In the early 1960s the platform canopy was removed. By 1961 goods traffic over the branch was declining rapidly with only two trains serving the station each week. After final closure on 30 April 1962, Duke & Son continued to use the goods shed as a grain store. However in 1964 grain sacks stored against the wall in the goods shed caused the walls to bow out which eventually caused the roof to fall in. The station was demolished in 1965 to make way for road improvements which included a roundabout on the station site - this is known today as the 'Old Station Roundabout'. In 1971 a road was built bypassing the town centre; this followed the course of the goods sidings north of the station. 'Old Station Roundabout' is at the junction of the B2177 and the B3035 towards Corhampton. Tickets from Michael Stewart (except 0075 David Peareson). Route map drawn by Alan Young. Bradshaw from Nick Catford. L&SWR Rail-motor No.1 is seen at Bishops Waltham station in November 1904, shortly after the rail-motors started operating on the branch. Steam rail-motors were combined engine and carriage units with a driving cab at the opposite end to the engine portion and could be said to have been the forerunners of diesel railcars. The idea was to produce small, self-contained and economical units for use on lightly loaded services or relatively frequent shuttle services. The concept was sound enough but the practicalities were not; they were often underpowered, lacked the ability to cope at busy times, were hot and noisy to travel in, and additionally there was the problem of maintaining the units in steam locomotive environments. Most of the major railway companies experimented with various forms of steam rail-motor and three just managed to survive into BR ownership, but earlier designs, such as that seen above, were not so fortunate. The first two L&SWR rail-motors had been built jointly with the LBSCR. Numbered 1 and 2, they were vertical-boilered and, as built, had a verandah platform at the non-powered end. They were soon rebuilt with horizontal boilers and enclosed ends but, as with many early rail-motors, were ungainly machines. They operated in the Portsmouth area. In 1903 the L&SWR ordered two further rail-motors of its own. Nicknamed 'Tin Tabernacles', their engine portions were enclosed in a hideous steel box with two small portholes for the driver to peer through. The cab at the non-powered end was, however, to a much neater and more practical design. With the engine portions built at Nine Elms and the carriage portions at Eastleigh, this pair were also numbered 1 and 2 and designated class H12. Having been tried on the Basingstoke & Alton Light Railway they were found to be unsuitable and were withdrawn in August 1904. No.1 came to the Bishops Waltham branch in November that year. This view is taken from the coal yard opposite the platform; note the coal merchant's scales in the foreground. 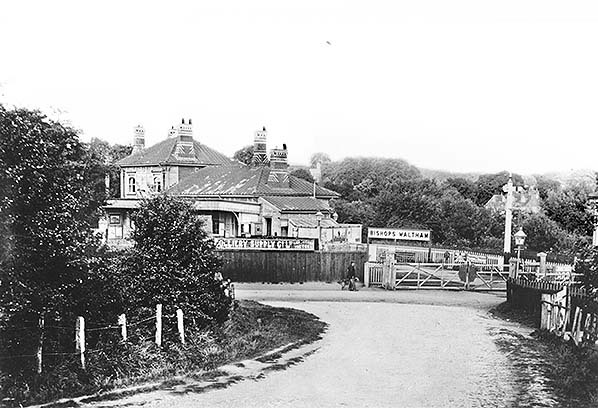 The merchant was probably Messrs Reeves and Tebbutt who opened an office adjacent to the level crossing in 1890. Note also the wire stays supporting the station canopy. There is a noticeable sag in the canopy. 1868 1:2,500 OS map showing Bishops Waltham station as built. The siding that served the clay works is seen curving to the north opposite the station building and runs off the passing loop. A short siding trails back towards the level crossing. Although not specifically shown on this map, the cattle dock was at the north end of the platform and is served by another trailing siding. The yard crane, which is shown, stands on the dock. Three long sidings run north-east towards the goods shed which is seen top right. One siding passes thorough the shed; note the wagon turntable on the north side of the shed. The western of the three sidings runs on to serve the gasworks. 1895 1:2,500 OS map. A number of changes have been made since the earlier map. The trailing siding opposite the station has been re-laid a little closer to the main line and served the coal yard of coal merchant Messrs Reeves and Tebbutt who opened an office adjacent to the level crossing in 1890; this is seen on the east side of the road. The cattle dock is now indicated with livestock pens on the dock just south of the crane. The engine shed which opened c1877 is seen on the gasworks siding; the water tank is adjacent to the shed with the coal stage just beyond it. The siding running alongside the goods shed has been removed as has the wagon turntable on the far side of the shed. A signal box which opened in 1885 is seen on the down side immediately south of the level crossing. 1909 1:2,500 OS map. Little has changed since the previous map. There is a new siding running parallel with the gasworks siding. This runs as far as the goods yard boundary. There has been some residential development to the west of the station. 1964 1:2,500 OS map. The station was closed by this date although the survey was probably made a couple of years before the publication date of 1964. The sidings serving the clay works and the gasworks have both been lifted. 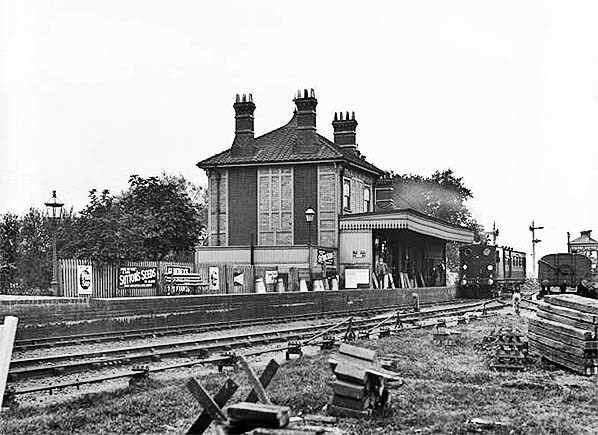 The signal box has been demolished, probably soon after closure in December 1935. The engine shed has been demolished, probably soon after closure in January 1933 although the adjacent water tank was retained in use till 1958. The livestock pens on the dock were removed when local livestock sales ended. The goods shed is now shown as warehouse having been used as such by Dukes of Abbey Mill since 1953. The building beyond the warehouse is a grain store, built by James Duke & Son in the 1950s. The coal office adjacent to the left crossing (above ‘LB’ - Letter Box) probably remained open for a time after closure of the station with the merchant getting his coal deliveries by road. Click here for a larger version. Bishops Waltham station looking south-west c1906. The clay and brickworks siding is seen curving away on the right in front of the rail-motor. The station signal box is seen on the far side of the level to the right of the signals. Rail-motor no.1 is again seen at the platform with its powered end facing the camera. Rail-motors 1 & 2 seated 40 passengers, of which eight were first class; there was also a small luggage compartment. The Bishops Waltham branch was no stranger to steam rail-motors as it was used for testing and running-in. Following on from Nos.1 and 2, a further batch, nos.3 - 15, appeared in 1905/6. Essentially similar, they differed from 1 and 2 in that the locomotive portion was enclosed in what was, in effect, an extension of the carriage body, and as a result their aesthetics were much better. Some of this later batch also worked the Gunnersbury service, based at Strawberry Hill. Nos.8, 9 and 10 – but possibly all of them -certainly appeared on the Bishops Waltham branch for running-in purposes, and photographs exist of 9 and 10. What happened next is something of a puzzle. The nature of railway operations during and immediately following WW1 meant that there was supposedly little work for the rail-motors. 'Tin Tabernacle' 1 and 2 had gone by 1916 and the remainder followed by 1919. A final view of rail-motor 1 at Bishops Waltham station c1906 with its non-powered end facing the camera. It seems Dugald Drummond, the L&SWR's Chief Mechanical Engineer since January 1905, had written off the rail-motor idea as early as 1906 in favour of push-and- pull trains so the rail-motors appear to have been doomed irrespective of WWI. The second batch, nos. 3 -15, were converted into push & pull driving trailers. This was the fate of many former steam railmotors, especially on the GWR, with many surviving into BR days, but for how long the converted former L&SWR railmotors survived is not known. No 1. Had only a short life however, being scrapped in 1916. 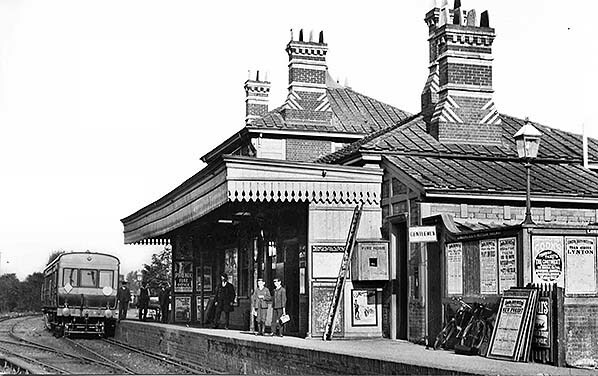 The side screens at either end of the station canopy were a later addition, having been added by 1895. A fire hose box is fixed to the screen closest to the camera. The gents’ toilet is a separate block at the south end of the station building. The ladies’ toilet was inside the building entered from the ladies’ waiting room. The end wing of the building with a sloping roof is the lamp room. Although the station was lit by gas there would still have been oil hand lamps and signal lamps. The lamp room was used for their storage, preparation and servicing. One of the station gas lights is seen on top of the gents' toilet. Looking east towards Bishops Waltham station from Victoria Road c1912. The end of the signal box can just be made out on the extreme right. The sign fixed to the fence to the left of the level crossing is for the principal coal merchant at that time, the Colliery Supply Company; their office on Winchester Road is hidden by the trees on the left. Black letters on a light cream background with a salmon pink border were used on L&SWR signs as seen here on the Bishops Waltham running-in board. 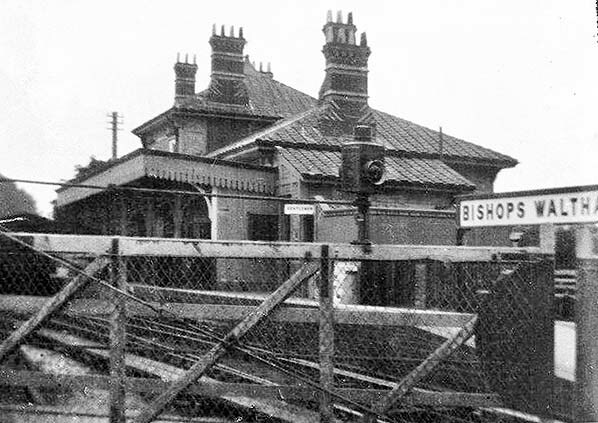 Bishops Waltham station entrance seen from Winchester Road in one of the first two decades of the twentieth century. 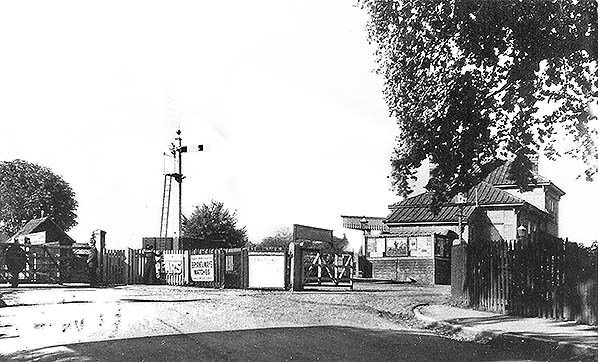 The gates on the right gave access both to the station and the goods yard. The small building in front of the tree on the left is the principal coal merchant's office. In 1862 there was a proposal to replace the, as yet unbuilt, level crossing with an underbridge but this was dropped because of the high cost of draining part of the Bishops Waltham pond to accommodate the bridge. 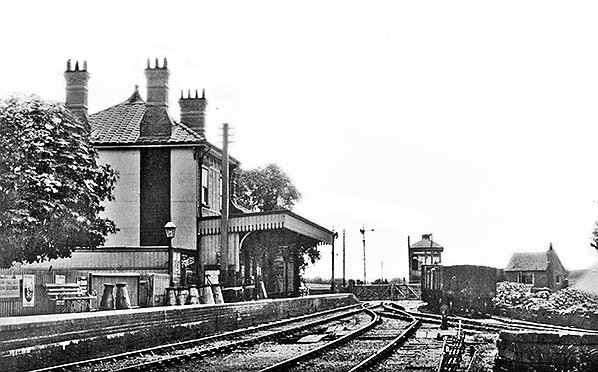 Bishops Waltham station looking south-west towards Botley c1912. Coal wagons are seen in the siding on the right, and the Colliery Supply Company's yard appears to be well stocked with coal. Their office is seen on the right. The clay woks siding curves to the north in front of the yard. Note the milk churns stacked on the platform; these would have been collected every day by the daily goods train which, in 1919, left the station at 10.15 am. Some additional timber supports have been added below the canopy as the wire stays have been removed and the canopy has lost its sag. Bishops Waltham station seen from the Winchester Road level crossing in L&SWR days. After the Southern Railway took over on 1 January 1923 the station signs would eventually have been repainted with green background and white lettering. For their buildings the L&SWR used a salmon colour for planking, valancing, etc and dark brown for doors, framing and metalwork. A cream colour was also used which could take the place of the salmon, often on the same station, particularly on canopy valancing. Window frames and glazing bars were supposed to be white, but photographs show that some were a dark colour, probably brown. Poster boards were painted in the brown, with the top panel in cream with black lettering; this could be 'L&SWR' or spell out the company name in full, and may have been enamelled metal. Cast iron signs were painted white with red lettering.